Haq's Musings: Shale Revolution Poses Threat to Saudi Economy, Power and Influence? Shale Revolution Poses Threat to Saudi Economy, Power and Influence? The rise of the West was driven by the Industrial Revolution beginning in the 18th century. It has since been fueled by fossil fuels--initially coal and later with oil and gas. Coal was indigenous in Britain and America but it is highly polluting and left much of London and New York with a thick coat of soot on everything in sight. Oil burns relatively cleaner but much of it is in the Middle East, particularly in the Persian Gulf region. First Britain and then United States saw the significance of the region and sought to control its energy resource through dictatorial puppet regimes, many of which still survive with active support of the Western powers. Recent US EIA report on vast shale oil and gas reserves (over a trillion barrels) in many countries, including Pakistan (9.1 billion barrels of oil and 105 trillion cubic feet of gas), has prompted a warning to Saudi government from Saudi Prince Alwaleed Bin Talal. While the Prince's warning is about economic impact, I see much broader long term implications of it for the US-Saudi alliance and the power and influence of the Saudi royalty in much of the region and the rest of the world. The top ten countries together have 345 billion barrels of shale oil reserves These include Russia (75 billion barrels), United States (58 billion barrels), China (32 billion barrels), Argentina (27 billion barrels), Libya (26 billion barrels), Venezuela (13 billion barrels), Mexico (13 billion barrels), Pakistan (9.1 billion barrels), Canada (8.8 billion barrels) and Indonesia (7.9 billion barrels). Notable on this list are US and China, the top 2 consumers of oil in the world, both having vast shale oil reserves of their own. In an open letter to Saudi Oil Minister Ali al-Naimi and other Saudi ministers, published on Sunday via his Twitter account, Prince Alwaleed said demand for oil from OPEC member states was "in continuous decline". He said Saudi Arabia's heavy dependence on oil was "a truth that has really become a source of worry for many", and that the world's biggest crude oil exporter should implement "swift measures" to diversify its economy, according to news media reports. Shortly after the Prince issued his warning, a report from OPEC published this week showed the group's oil export revenue hit a record high of $1.26 trillion in 2012. However, forecasts from the group raise doubts over whether that level of earnings can be sustained in the face of competition from shale oil. Saudi Arabia, the world's biggest oil exporter, is now pumping at less than its production capacity because of declining consumer demand, Prince Alwaleed said in the letter. Saudi dependence on oil stems from the fact that nearly 92% of the Saudi government budget this year comes from oil , according to Wall Street Journal. The growing shale oil production in the United States means Saudi Arabia will not be able to raise its production volume to 15 million barrels of oil per day, Prince Alwaleed said. Current capacity is about 12.5 million bpd; a few years ago the country planned to increase capacity to 15 million bpd, but then put the plan on hold after the global financial crisis in 2008. Oil-rich Gulf nations like Saudi Arabia, Qatar, UAE and Iran have used their petrodollars to influence events in the Middle East and West Asia. They have funded their favorite sectarian groups to fight bloody proxy conflicts in Lebanon, Iraq, Pakistan and Syria. Saudis have bankrolled radical Sunni groups in Pakistan while Iran has financially backed Shia Hezbollah in Lebanon and other radical Shia groups in Iraq and Pakistan. Qatar, Saudi Arabia and UAE have supported pro-West elements to roll back democracy in Egypt. Even if Saudis do heed Prince Alwaleed's warning and succeed in diversifying their economy, it is highly unlikely that the desert Kingdom would be able sustain its current power and influence over the long haul. This is going to be bad news for the rulers who will respond with violence to resist change. But it is potentially good news for the Saudi people and the Arab and Muslim world at large. It'll open up opportunities for reforms leading to positive changes in the Middle East and the surrounding region. So why would we be worried about Saudi economics? Let them worry about it. We have enough to worry about at home already. Argus: "So why would we be worried about Saudi economics? Let them worry about it. We have enough to worry about at home already." The USA is expected to produce more oil than the KSA by 2020!!!!!!!!!!!!!!!!!!!!! Shale Gas has changed the energy landscape in the USA. Europe is also trying to follow suit but they are far behind at this point in time. Really bad news for the oil producing Middle Eastern countries. Don't think they are capable of coping with the crises. Not all of them can try to survive by becoming tourist places like Dubai. Happens when you don't do forward planning and expect Aayaashi to continue forever. KSA and Qatar are the main funders of the world terrorism. Qatar seeks to create problems for syria and iran to continue its gas supply to europe. This evil is supported by the USA, who are ready to anything in return for petrodollars. The axis of evil is the KSA, qatar and USA link. The iran syria pipeline projects would burst this evil axis. The world will be a much safer place once these countries lose economic power. Non aligned countries like Iran have to show the way. The USA is the most selfish and self serving regime in the world by creating an impression that US is always right. The biggest misfortune is that eastern philosopy and culture is being seen as less modern and the people of Asia are embracing western ideas and views at face value. For eg. Love marriage, Exposive clothing are seen as modern and forward without thinking about pros and cons. Instead we fight with each other based on religion and trying to convert by force. We want another jesus, buddha and muhammad to make these fools understand that "united we stand, divided we fall" and "love is the biggest service to god" not hating other religions and people. ok some clarification oil shale and shale oil are two different things. Oil shale which the US has 3 trillion barrels worth of contains kerogen which can be processed into oil. Shale oil is normal crude oil found in previously uneconomic shale formations. In any case as an Exxon CEO famously quipped man did not leave the stone age because we ran out of stone! Similarly we will find an oil solution well before there is this neo malthusian peak oil moment! I am sure of this LENR,solar,grid storage,nuclear fusion...the kind of investments and the kinds of results people are getting give me hope for the very near future. The absolute tragedy of the muslim world is the relatively less civilized countries of the GCC have the oil and influence to impose their primitive ways while the relatively civilized countries Turkey,Egypt,Lebanon etc have no or little oil! This hopefully will be recified shortly! Hopefully it will curb Wahabis' killing of Shias and funding of Muslim-Muslim wars such as in Syria. Shams: "Hopefully it will curb Wahabis' killing of Shias and funding of Muslim-Muslim wars such as in Syria." I agree, and also hope that it'll also reduce Iran's funding of Shia radicals who wage wars against Sunnis for control of Iraq, Lebanon and Syria, and proxy sectarian wars in other parts of the Muslim world. Iran is not Arab. It is a highly sophisticated society with advanced technology at par with Israel. It builds its own civil structures, its own missiles, rockets, rocket engines, satellites, ships, submarines, airplanes, fighter jets, motor cars and nuclear centrifuges. Also, there is not an iota of evidence that Shias ever attacked Sunnis, and if ever anything is done, it is some degree of retaliation in extreme cases of brutality against Shias. It even donated a gas pipeline to highly Talibanistic Pakistan, and it is helping highly Al-Qaeda-istic Afghanistan. So your premises is flawed, as it mostly is. All shia ayatollahs have barred any action against any Muslim, whatever the sect, or disrespect for Sunni religious heads. Iran is not going the fate of the Arabs. Shams: "Iran is not Arab. It is a highly sophisticated society with advanced technology at par with Israel...."
They are not at par even with Pakistanis. That's your Shia bigot speaking from inside you. Pakistan gave Iran its centrifuges along with design details in 1980s, and now we are in 2013 and Iran still does not have a nuclear bomb. Experts who have studied it believe Iranian scientists are incompetent, citing the fact that it took UK and Pakistan less than 5 years to build a bomb after they started the effort. In "Confront & Conceal" by David Sanger, there is a secret assessment of US scientist Gary Samore about the incompetence of Iranian nuclear scientists. Iranians have taken much much longer and still not achieved what the Brits, Indians and Pakistanis did in much shorter time to build nuclear capability. As to the Ayatollahs, they are brutal as was demonstrated by mass executions of opponents they ordered after the fall of the Shah. Wrong, as always. You are an ignorant bigot. Pakistan was able to complete its program because the US and UK looked the other way, and in fact indirectly helped Pakistan by not intervening. The goal was to contain India while India could contain China. The world's nuclear control regime was weaker, and Pakistan had not signed the NPT. The entire Muslim world, including Iran, supported Pakistan financially and morally. In Iran's case, it is exactly the opposite. Still, with all the anti-Iran hysteria in the Muslim world against Iran, Iran is where it is. Going to the original point at discussion, Iran is not likely to fall like Arabic world. Shams: "Pakistan was able to complete its program because the US and UK looked the other way, and in fact indirectly helped Pakistan by not intervening...."
I never defend any Sunni Arab nations like you defend Shia Iran. You keep missing the point. In your article you say that unless Saudis "diversify", with shale gas they will be doomed. Iran is also well diversified. It is one of the large steel makers and aluminum smelters. Huge in other industries. Nearly one trillion in GDP (PPP). That is almost the size of Saudi Pakistan, and UAE combined. Iranian ayatollahs have unanimously voted against a nuclear bomb. Iran got its centrifuges going in 2007, only after the Russians put a nuclear power plant in Iran. I think your facts and your analysis are good only for the fake TV show that you come on. You have always been against a Pakistani nuke. I have reminded you about 10 times what you said re. it on a British Airways flight when you were returning from Israel/Egypt, and I from the Netherlands. Pakistan spent from 1975 to 1991 before it had a lab grade bomb. That does not sound like 5 years to me. I am not pro-Iran as much as I am against your fake assertion of knowledge. Shams: "You keep missing the point. 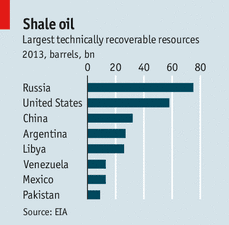 In your article you say that unless Saudis "diversify", with shale gas they will be doomed. Iran is also well diversified. It is one of the large steel makers and aluminum smelters"
Your claim that Iran has diverse economy is false. 80% of Iran's foreign earning come from oil exports. The Iranian Ayatollah's fatwa is bogus...it's a strategy to get as far as the "screw-turn" close to a bomb to avoid being attacked by US. You have a long history of vigorous defense of all things Shia regardless of merit. You even support butchers like the Asad family of Syria simply because you consider them as Shia. Your recollection of our BA flight conversation in mid-1990s is either faulty or a deliberate lie. As to Pakistan, its weapons program only began after the Indian tests in 1974, and Pakistan was a screw-turn away from the bomb in mid-1980s when Aslam Beg under Zia threatened to use it against India when India carried out massive war exercises near Sindh border to intimidate Pakistan. Your ignorance is only exceeded by your extreme bigotry. ^^RH: "Your claim that Iran has diverse economy is false. 80% of Iran's foreign earning come from oil exports"
"It just shows your misguided yardstick is volume of exports rather than domestic production and consumption of everything from autos to cement to food and beverage." Strange, is it not? When I point out that 80% of our foreign earnings come from 'Chadar, Chawal, Chamdi', indicating a narrow & shallow economy, you reply by calling me misguided for confusing between exports and the domestic economy. And now you are saying that Iran is not diversified because 80% of its foreign earning come from petro-products. Have you considered your own suggestion and reflected on their domestic economy? Please make up your mind and let us know. HWJ: "And now you are saying that Iran is not diversified because 80% of its foreign earning come from petro-products. Have you considered your own suggestion and reflected on their domestic economy?" First, I mentioned autos and steel in response to your ridiculous claim that Pakistan has no industry. Second, Pakistan's exports are more diversified than Iranian exports. Unlike Iran's oil making up 80% of exports, Cotton and cotton products, leather and rice accounted for 63.7% of Pakistan's exports in the first nine months of 2012-13. ^^RH: "Second, Pakistan's exports are more diversified than Iranian exports." 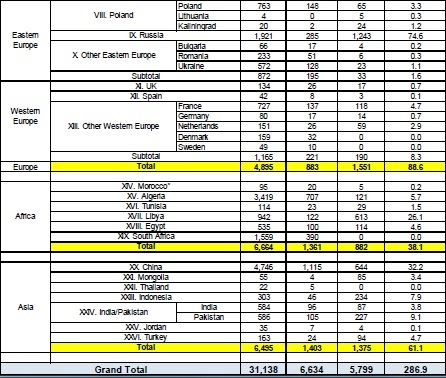 HWJ: "Here are the simple index comparisons of product diversification of exports"
It confirms my point that both Pakistani and Saudi international trade is more diversified than Iran's. Note an interesting anomaly: The rating for Pakistan is correct, but the ratings for Saudia and UAE are CONTAMINATED. Why? Because UAE serves as a hub for Indo-Pak trade and Saudia serves as a hub for inter-Arab trade between West Asia and North Africa. So many of the things that show up as "exported" by UAE are actually Indian and Pakistan exports to each other. Similarly, many of the things that show up as "exports" by Saudia are actually exports of the West-Asian and North African countries to each other. Same is true, incidentally, for Hong Kong, as it is a trade gateway for China. NEW YORK — US proved oil reserves grew by a record amount in 2011, according to a government report Thursday, in the latest indicator of the North American energy boom. The US added 3.8 billion barrels of crude in 2011, a 15 percent increase, according to the US Energy Information Administration. The amount represents a record volumetric increase in oil reserves for the second year in a row, EIA said. Proved oil reserves stood at 29.0 billion barrels in 2011 (vs 257 billion barrels in Saudi Arabia), the highest volume since 1985. "Horizontal drilling and hydraulic fracturing in shale and other tight rock formations continued to increase oil and natural gas reserves," said EIA Administrator Adam Sieminski. "Higher oil prices helped drive record increases in crude oil reserves, while natural gas reserves grew strongly despite slightly lower natural gas prices in 2011." The data came as US petroleum producers continue to push oil output to levels not seen since the early 1990s. Energy companies have also boosted natural gas output in recent years due to the shale boom. While natural gas output varies monthly somewhat due to incremental investment decisions, US natural gas production has been at record levels in recent years. The US added 31.2 trillion cubic feet (0.9 trillion cubic meters) of natural gas reserves in 2011, an increase of 9.8 percent, the EIA said. The 2011 natural gas volumetric increase was the second largest in US history after the 2010 rise. The nexus between Arab charities promoting Wahabi and Salafi traditions and the extremist Islamic movements has emerged as one of the major threats to people and governments across the globe. From Syria, Mali, Afghanistan and Pakistan to Indonesia in the East, a network of charities is funding militancy and mayhem to coerce Muslims of diverse traditions to conform to the Salafi and Wahabi traditions. The same networks have been equally destructive as they branch out of Muslim countries and attack targets in Europe and North America. Sulaimaniya, Iraq — As one could see from President Obama’s recentinterview in The Atlantic, he pretty much hates all the Middle East’s leaders including those of Turkey, Iraq, Syria, Israel, Saudi Arabia, Qatar, Jordan, Iran and the Palestinians. Obama’s primary goal seems to be to get out of office being able to say that he had shrunk America’s involvement in Iraq and Afghanistan, prevented our involvement on the ground in Syria and Libya, and taught Americans the limits of our ability to fix things we don’t understand, in countries whose leaders we don’t trust, whose fates do not impact us as much as they once did. After all, the president indicated, more Americans are killed each year slipping in bathtubs or running into deer with their cars than by any terrorists, so we need to stop wanting to invade the Middle East in response to every threat. That all sounds great on paper, until a terrorist attack like the one Tuesday in Brussels comes to our shores. Does the president have this right? The Kurdish government, which was allowing a strong opposition party to emerge and a free press, is now backtracking, with its president, Massoud Barzani, refusing to cede power at the end of his term, and the stench of corruption is everywhere. The Kurdish democratic experiment is hanging by a thread. More U.S. aid conditioned on Kurdistan’s getting back on the democracy track would go a long way. Kurdistan and Tunisia are just what we dreamed of: self-generated democracies that could be a model for others in the region to follow. But they need help. Unfortunately, Obama seems so obsessed with not being George W. Bush in the Middle East that he has stopped thinking about how to be Barack Obama here — how to leave a unique legacy and secure a foothold for democracy … without invading.